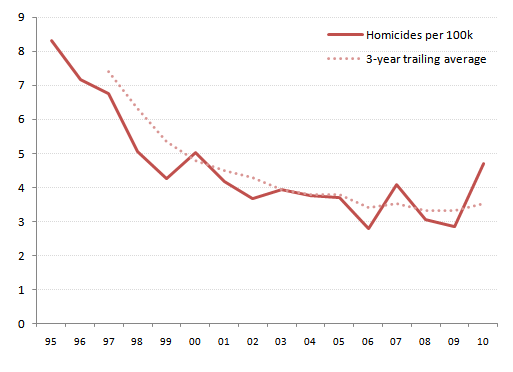 The Statesman recently highlighted an increase in homicides from 22 in ’09 to 37 in ’10. While the piece provided a compelling visualization with the long-term count of homicides in Austin, it did not provide data that adjusted for the city’s population growth. In the chart below, I provide the number of homicides per 100,000 residents within the city’s total area, as well as a 3-year trailing average. Austin appears to have bottomed at around 2.8 homicides per 100k residents. I wonder if the recent increase in rate volatility combined with the potential for a trailing average uptick in the near future is a result of more young men migrating into Austin, or perhaps a shift in the underlying community demographics towards a younger city. Given the relatively high proportion of the City of Austin budget dedicated towards public safety, it seems feasible to ask for policymakers and APD to anticipate a demographic shift and begin putting programs (e.g. targeted after-school for boys with behavior issues at school) in place that can mitigate the effects of the shift. A lot of our effectiveness in catching a potential wave will depend on the urgency placed on public safety risk management by the City Council. I say ‘risk management’ because it’s unclear if indeed there’s a fundamental demographic transition that will make the days of 2.8/100k extremely difficult to repeat; however, the data should make us want to hedge against that possiblity. Hopefully, this chart gets the (some?) conversation started. Here’s my data file in XLSX format (AtxHomicideRate) . Population numbers come from the City demographer’s website. This entry was posted in Public Safety and tagged austin, austin police department, city council, crime, homicides. Bookmark the permalink. That said, year to year variations in murders are tough to interpret because you’re dealing with VERY small numbers. Also, of all crimes it’s most difficult to prevent murders, especially with broad, general approaches like after school programs. What is the best Midi keyboard and music production software out there?